I had a great time at Costume College this year. I'm super late at getting this post up (uh, hello, it's now January 1st, lol). Although honestly even having a great time at CoCo this year, it was a bit of a rough year - I had something going on at home that kept me very occupied throughout the few days, and I was also really jet-lagged more than usual this year. All the stress of lots of focused sewing and jewelry making leading up to Costume College, plus the life stuff, meant that while I had a really great time, I also spent much of the weekend a bit stressed and tired (look closely at my eyes in the photos - you can see the tired). It's always a blast to be around so many wonderful and inspiring people though, and see so many friends as well as meet new ones! Here's my outfits for Costume College 2018! From L to R top, L to R bottom: Thursday night, Friday night, Friday day, Saturday day, Saturday day, Sunday - I made 3 ensembles just for Costume College and made my own jewelry parures or demi parures for all of them! Thursday was a busy day as we went fabric shopping in the L.A. Fashion District during the day, before coming back and dressing for the evening! For me, Thursday night was all about my FIRE jewelry from LadyDetalle. I found a small stash of (pricey!) 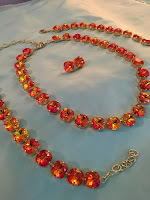 discontinued fire opals from Swarovski, which I used to create a parure of necklace, earrings, two bracelets and a ring. Basically I planned an entire outfit around the fire stones I found, lol! I also scouted down a vintage silk dupatta from India in a lovely dark yellow and red with a bit of orange tones that looked like fire. Basically Thursday night was a blur of getting to meet some lovely customers, see some old friends and just enjoy the start of the long weekend! It's always a bit hard to mingle with such large crowds as I'm an introvert (an extroverted introvert, but an introvert nonetheless). That said, I really had a lovely time and enjoyed seeing so many lovely and creative outfits! Friday was all about Victorian bustle! 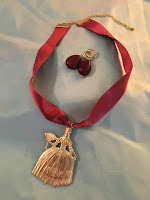 Friday day I re-wore my white dotted swiss cotton early 1870's trained bustle, paired with ruby red rare glass grapes, ribbon necklace and matching ruby red glass grapes earrings from LadyDetalle. 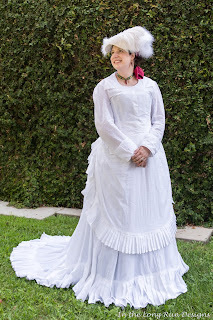 I made this summer bustle for Kat's Victorian At the Races party this summer. I wanted to add a bit more pleated trim before I wore it this second time, but I ran out of time, so instead I settled for necessary fixes to shorten the front of the main skirt a bit (so I didn't trip when I walked) and re-ironing some pleats that had relaxed in the humid weather. 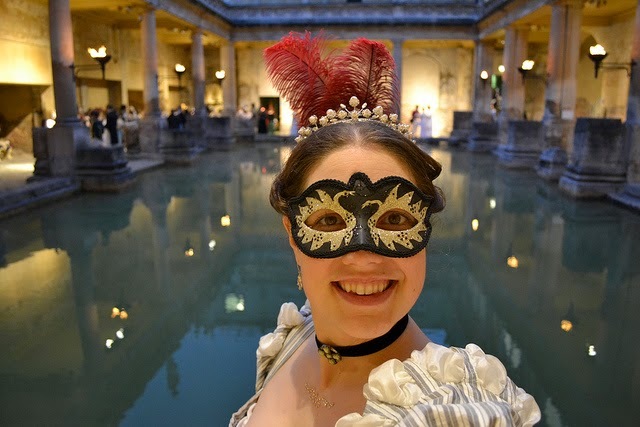 This was really fun to wear, but I felt pretty jet-lagged Friday day, so if I looked tired or didn't respond quickly, I was a bit out of it, lol. I wore AD Balmorals with this and my evening gown: I love them, so comfortable! 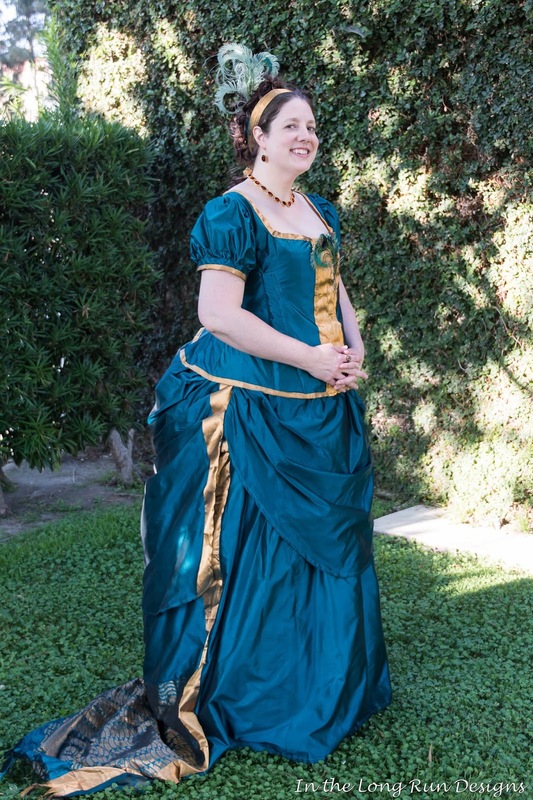 Friday evening I re-wore my Teal and gold 1880's bustle from two silk sari's which I started in late December 2017 and finished in January 2018 - and wore to Carolyn's Holiday tea. 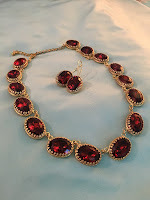 I absolutely adore my jewelry demi parure I made to go with this for Costume College: a necklace, earrings and matching ring of stunning hard-to-find vintage madiera stones! I think I may have found enough stones to make one more. I wore this to the Friday night social, and I just love this dress, how it flows, the fun sari fringe trim that I used to create a bit of a train: I really enjoying wearing this dress and feel like a bit like a teal peacock in it, lol. I had a great time chatting with all sorts of folks, checking out all the lovely outfits and meeting a few folks I know from IG or who know me from IG - it was great to meet so many of you in person! Here's a link to my Friday photos from Costume College. Saturday was all about Regency! First up, for the daytime, I wore my bib or apron front gown made from a mustard design stripe cotton from Treadle Quilt Shop in MN - 100% hand sewn, this one was started in May during a Burnley & Trowbridge workshop, and finished in the months coming up to CoCo! I also made a sleeveless spenser out of my leftover bee silk brocade fabric that my court train was made from in 2016. 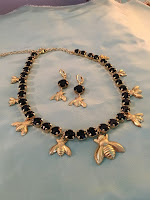 I added triangle trim to give it some interest, and paired it with my "Josephine" black BEE demi parure: necklace and matching earrings. 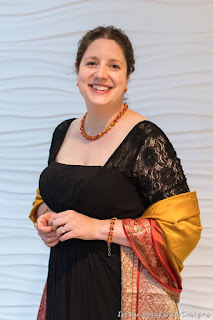 I also wore a vintage silk mustard and black shawl (dupatta) from India and a vintage German metal gold wreath tiara (a vintage wedding tiara from the 1950's I believe) that I acquired from Judy. I wore my AD Hartfields. I really enjoyed wearing this for the first time! It was very comfortable and the ensemble was everything I was imagining it to be when designing and creating it, so yay. I look forward to wearing it again sometime. Saturday evening for the Gala was all about BEES & GRAPES! 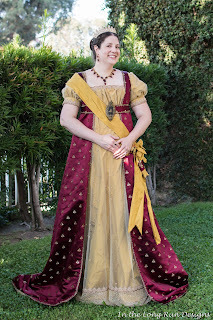 I re-wore my BEE silk brocade in burgundy with gold bees COURT train, and made a a new dress to wear underneath, along with court sash, new tiara and demi parure. I was going for Empress Josephine just after being crowned, and was really happy with this re-wear and re-vamp of my Regency BEE Court ensemble! The Gala was really fun - the food was fine, the company was great, I enjoyed the entertainment, and then once it was time for the dancing, I opted to head out to the front room and chat with folks: I chatted with friends and met so many great folks and was excited to meet folks wearing tiaras and jewelry from LadyDetalle! (oh, how exciting and fun!). It was a wonderful evening! Here's a link to my Saturday photos from Costume College. and Maid Brigade photo album. Sunday was my "Dress of Wrong" group - I was SO excited to finally do this! The premise: any era, appropriate silhouette, clearly wrong fabric. Wrong" ensemble: 18th century "Victorian"
I've been wanting to do a dress of wrong ever since I attended Costume Con in 2009, when friends made a Hello Kitty late 18th century and a John Deer bustle! 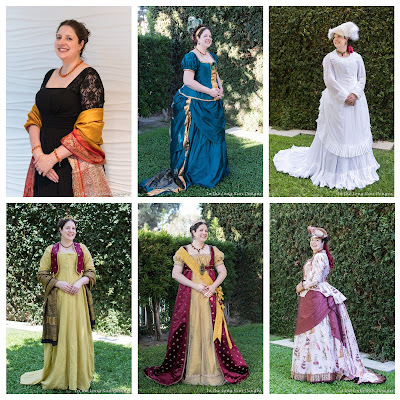 I was super excited to find that there was a lot of interest in joining the group, and we ended up with a nice-sized group of ladies who each made or wore a dress based on the premise above! 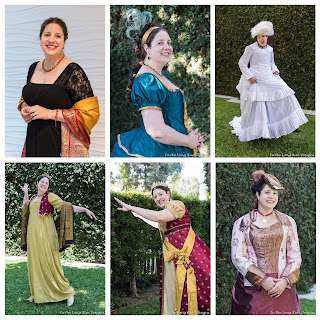 Strawberry shortcake late 18th century, a Steelers royal bustle, the Queen in a dressing gown, Beauty & the Beast late 18th century and more: I had SUCH a fun time with this group and with making and wearing my DoW outfit. I found a lovely fashion plate ladies fabric on Etsy that was mid to late 18th century women: it was listed as "Victorian women", so I figured it would be MOST appropriate to make an 1870's trained bustle out of this fashion plate fabric, paired with a vintage silk sari! 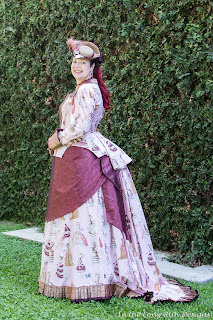 I re-vamped my tiny tricorn, paired it with pink red locks, and wore my AD Balmorals again. 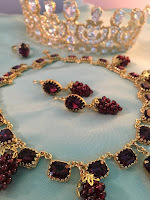 I made a burgundy silk satin ribbon choker necklace with a shiny brass Marie Antoinette on it, and coordinating burgundy mookaite jasper teardrop earrings! Sunday was a lot of fun - I really enjoyed the freedom and fun of doing Dress of Wrong, and I spent some time chilling with old and new friends, and really enjoyed! Here's a link to my Sunday photos from Costume College. 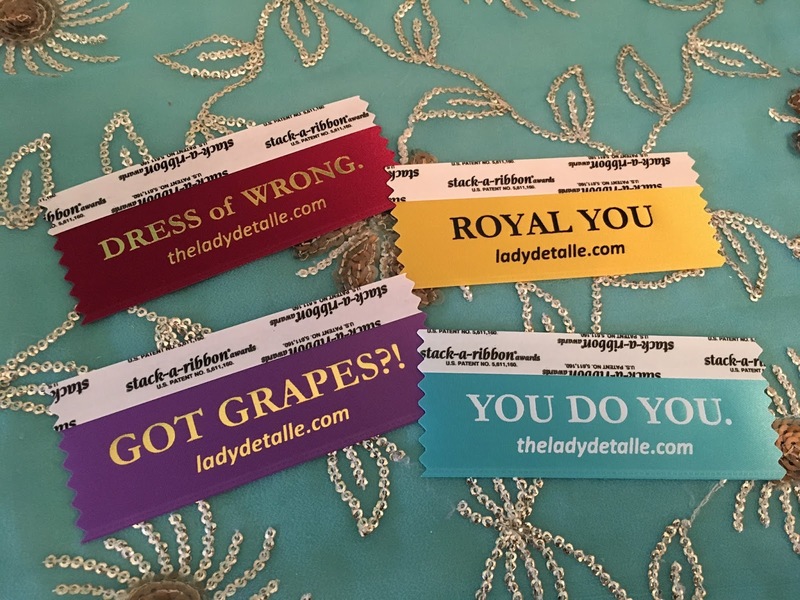 Costume College badges ribbons I made & gave out in 2018! 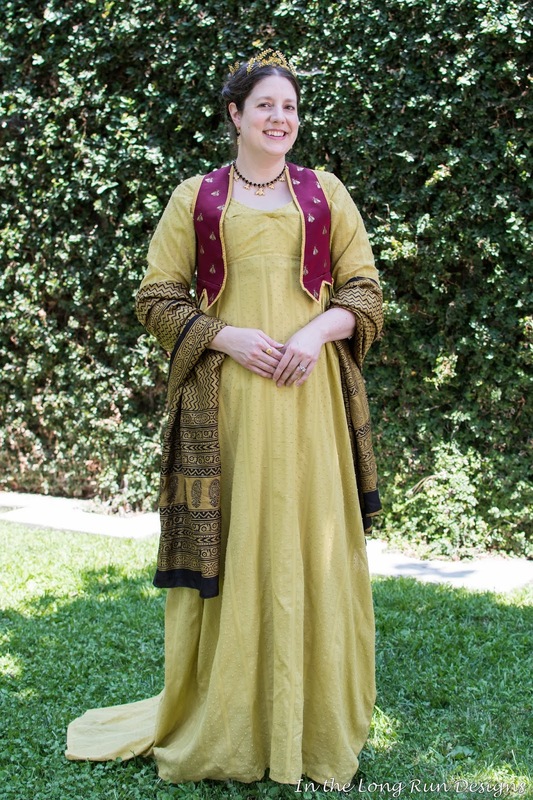 YOU DO YOU - Historical Costuming = FUN, all are welcome! Dress of Wrong - for our group and anyone who supports the idea! 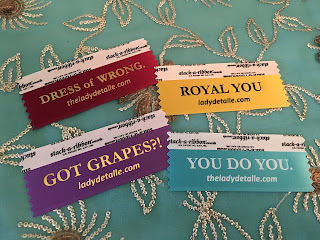 Royal YOU - royal you collection of LadyDetalle jewelry and also anyone who feels royal! I had a LOT of fun this year, despite the life stuff, as evidenced by the silly photos above, also captured by InTheLongRun (my roomie) - thanks for the great photos, Gloria! I'm looking forward to going again in a couple of years, and I will truly miss everyone in 2019, since I'm not able to go this next year (we have other travel plans this year). I'm really looking forward to seeing everyone's lovely ensembles and fun times though!